Of all the features in a room, the mirror has the biggest impact. It offers the viewer a reflected image, while at the same time sending reflected light to all corners of the room. If you are in the process of designing an antique living room or study, mirror selection and placement – is a critical component to achieving a balanced look. If you wanted to make a room appear wider than it actually is, a horizontal mirror would do the trick. A narrow room with a high ceiling would benefit from a horizontally located mirror, while a wide room with a low ceiling becomes narrower with a portrait placing of the mirror. Ask any interior designer about using mirrors in an antique setting and you will be given some good advice regarding the period that would be most suited, as well as the size. There is only so much natural daylight in a room and with clever placement of mirrors, one can greatly increase the amount of light in the room, by way of reflection. Any antique setting would look better in a dimly lit environment and in such a case, a mirror or two correctly placed will reflect a darker area. The role of a mirror, design wise, is to add some natural light, while at the same time, giving the viewer a reflected image. If placed above a mantle, the mirror accentuates the fireplace, which is the focal point of the room and the frame width would depend on the size of the room. 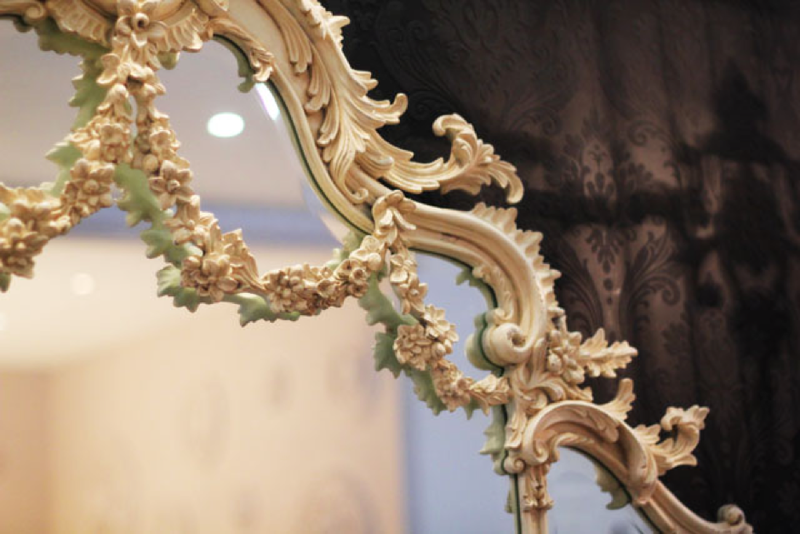 The range of styles is indeed extensive, with splendid wide-framed pieces from the Louis XIV era and elegant Victorian frames that are intricate in design and hand-painted. Should you be looking for an antique mirror, there are online dealers with antique overmantle mirrors of all shapes and designs and searching by either period of colour, you can quickly find something just right. There are Georgian, Tudor, Edwardian and Victorian examples and the rich French creations offer opulence and elegance in a range of natural colours. White is predominant of the French Renaissance period and there are some stunning pieces available from online antique dealers, who can access a nationwide network of antique items for sale. A mirror or two might really complement a room, yet too much reflection creates a look of chaos. Even a single mirror that is too large for the setting will create the wrong ambience. Equally, a lack of mirror reflection can detract from the intended outcome and asking a professional interior designer for their opinion is always a good thing. While there are no hard and fast rules regarding mirror placement, a few hours of online browsing will certainly give you some ideas and by forging an alliance with an established online antique dealer, you can consult him about your intended design ideas. Pinterest has a great collection of mirror design images to browse, and once you have the right design, your online antique dealer can source the perfect piece. Mirrors can be very effectively used when designing an interior and if you are looking at vintage or antique, check out a few online antique dealers to see some suitable pieces. This article is published in partnership of Mediabuzzer.